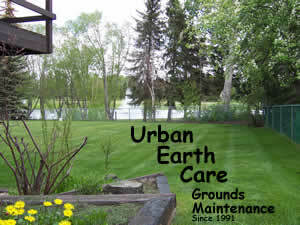 Urban Earth Care has been providing Grounds Maintenance and Landscaping Services to our clients in Edmonton and Nisku since 1991. Weekly lawn mowing, final grades , fertilization and weed control, Custom Vegetation Management Programs, Landscaping and Skid Steer services. If we cannot provide you the service that you are looking for, we will endeavor to refer you to another company who can. Large residential and small to medium commercial properties are the specialty of Urban Earth Care. We have Licenced Pesticed Applicators on staff and are fully insured for pesticed applications.